Cutlet from fried meat on grill with Bulgarian red sweet pepper. 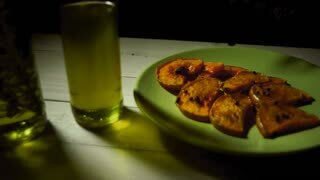 The products are roasted separately, without mixing. A good dish for a mixed group of people from meat-eaters and vegetarians. 요리사 그릴 스테이크를 굽고있다. 요리사가 고기를 굽기. 고기의 로즈마리와 마늘. 스테이크를 켭니다. 요리의 준비. 레스토랑. 식품. 달콤한 부드러운 고기. Raw steak and spices. 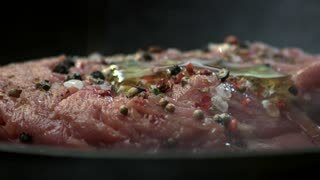 Meat with oil on pan. Cook a dish from beef. 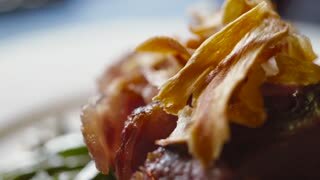 Close up view of a served roasted meat on the plate. Delicious food, in the restaurant. Non vegetarian lifestyle. 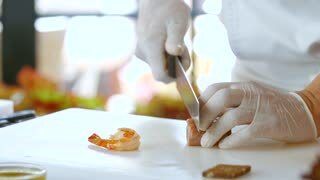 Knife cuts cooked fish meat. Hands with kitchen knife. Juicy fried tuna. Roasted shrimp on cooking board. 24. 08. 2015 Kiev, Ukraine. 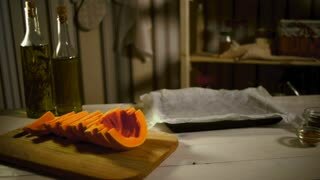 Cook demonstrates his signature dish. Meat from the chef. Meat in fire. 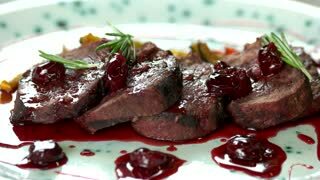 Roasted veal with cherry sauce. Meat dish macro. Slaughterman is cutting fresh meat. Butcher cut pork carcass separating the skin from meat with a knife at farm market. Meat industry concept.